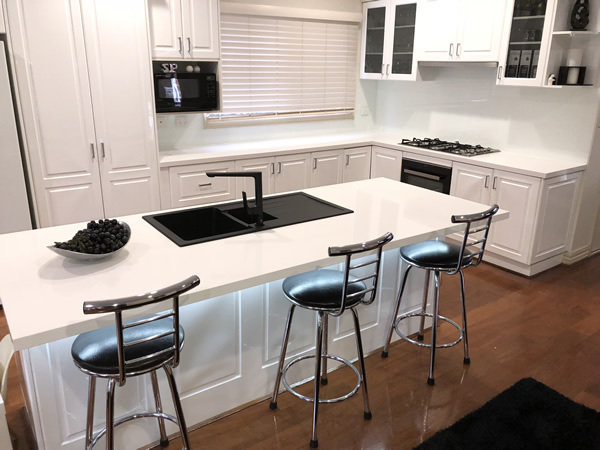 At Just Benchtops, we offer the best kitchen design and fresh ideas for incorporating a new engineered stone benchtop into your kitchen to create a space that your family and friends can enjoy. We can create simple and elegant designs using Caesarstone, Lithostone, Smartstone, or Quantum Quartz in different colours, finishes and widths specific to your kitchen, matching your lifestyle and needs at the same time. Engineered stone has a resistance to weathering which makes it a popular choice for kitchen benchtops, splash backs, vanities and more. Due to this resistance benchtops made with this material are scratch, stain, heat and chip resistant – perfect for the kitchen, the space that is always used! Caesarstone is a man-made stone that consists of approximately 95% quartz, the other 5% is a mixture of polymer resins and colouring. Caesarstone is resistant to weathering which is why it is a popular choice for kitchen benchtops, splash backs, vanities and more. Lithostone is reconsituted stone used for kitchen benchtops, bathroom and living spaces. Lithostone has a sophisticated colour palette to compliment any design application or kitchen benchtop renovation. Smartstone quartz surfaces are designed to offer high performance with low maintenance. They are non-porous so don't require sealing or waxing. All Smartstone surfaces come with a 15 year limited warranty and are some of the best engineered quartz surfaces for your kitchen benchtops. View our engineered stone benchtop project gallery for inspiration. If you’re thinking of upgrading and bringing a new sense of life to your kitchen give the team at Just Benchtops a call and we can provide you with a number of engineered stone benchtop options designed to fit the unique dimensions of your kitchen.